For the species known as the African hunting dog, Cape hunting dog, or painted hunting dog, see African wild dog. A hunting dog refers to a canine that hunts with or for humans. There are several types of hunting dogs developed for various tasks. The major categories of hunting dogs include hounds, terriers, dachshunds, cur type dogs, and gun dogs. Among these categories further divisions can be made based upon the dogs' skill sets. Sighthounds are different from scenthounds in their methods and adaptations. The long lean head of the sighthound gives it a greater degree of binocular vision, and the body is usually quite slender with an elongated lower spine, giving a double suspension gallop when it runs. In many cases this class is older than the scenthound group: the greyhound, the Scottish Deerhound, and the Saluki have origins going well back into the Middle Ages and earlier. Their speed, agility and visual acuity are particularly adapted for coursing game in open meadows or steppes, and all of them are adapted for running down prey rather than just sniffing for them until they catch up. They are independent in nature, and are worked singly or in a "brace" of two or three dogs. Sighthounds are generally quiet and placid dogs compared to other hunting breeds, but are capable of explosive speed. Rhodesian Ridgebacks are one of the few hound breeds with both capabilities, and though they are not the fastest runners they are notable for having exceptionable endurance. Hounds Hounds are further divided into sighthounds and scent hounds depending upon the primary sense used to locate quarry. Many mammals such as jackrabbits, raccoons, coyotes, and large predators are hunted with hounds. Whippet Sighthounds are well adapted for visual acuity and speed. Their method is known as "coursing" - prey is often sighted from a distance, stalked, pursued and neatly killed. Sighthounds work quickly and quietly, and are by nature independent. Coonhound Scent hounds are hounds that primarily hunt by scent. Scenthounds are used to trail and sometimes kill game. They hunt in packs leading the hunters on a chase which may end in the quarry being chased into a tree or killed. Some of these breeds have deep, booming barks and use them when following a scent trail. Lurcher, 3/4 Greyhound, 1/8 Scottish Deerhound, 1/8 Collie A Lurcher is a sighthound crossed with a working dog breed−usually a pastoral dog or Terrier bred selectively for working. 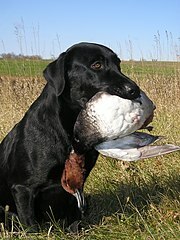 Gun dogs Gun dogs are used primarily by small game hunters using shotguns. Gun dogs are classified as retrievers, flushing spaniels, and pointing breeds. Chesapeake Bay Retriever Once classified as a water spaniel, a retriever's primary role is to find and return shot game to the hunter. Retrievers can spend long hours in a duck blind and visually spot and remember the location of downed birds. At command, they retrieve the birds. They may be able to follow hand, verbal, and whistle commands to the downed bird. They typically have large, gentle muzzles. English Setter Setters have a long history as upland gun dogs. They appear to have a native ability to locate and point at upland game birds. They flush the birds at the hunter's command. English Cocker Spaniel Spaniels have been used as hunting dogs for hundreds of years. Flushing Spaniels are used to locate and flush game for a hunter. German Shorthaired Pointer Pointers are dogs trained to locate and point at small game allowing the hunter to approach and flush the game. Pointing breeds have greater range than Spaniels. Poodle Water dogs are a subclass of retrievers. Typically they are strong swimmers with a lot of endurance and are bred to hunt all manner of waterfowl. Feist Feists are small dogs that hunt small game, especially squirrels, in a similar manner to large hounds hunting raccoons and large game. Feists may hunt in packs, and "bark up" on trees to alert the hunter. The feist was developed in the southern United States, reputedly from small Native American dogs and British fell terriers. Lakeland Terrier Terriers are used to hunt mammals. Terriers locate the den or set of the target animal and then bolt, capture, or kill the animal. A working terrier may go underground to kill or drive out game. Hunters who use terriers are referred to as terriermen. Larger members of this class, like those of the bull and terrier family, are sometimes used to hunt larger game, like razorbacks: the hunter will send in scenthounds to corner the pig and the much more heavily built dog will charge at it and bite and hold it down until the hunter can come. Catahoula Cur Curs hunt similarly to terriers, though usually larger game. Curs are used to hunt boars, raccoon, cougars, and other large mammals. Dachshund Dachshund was bred to scent, chase, and flush out badgers, foxes and other burrow-dwelling animals, while the miniature dachshund was developed to hunt smaller prey such as rabbits. In the American West they have also been used to hunt prairie dogs. In Europe dachshunds are widely used for hunting deer and smaller game such as rabbits and hares. They are also excellent scent dogs and they are often used to track down wounded animals after car accidents for example. Dachshund is also the only certifiable breed of dog to hunt both above and below ground. Spaniels definitively fall into two types: ones that seek prey in water and others that seek it on land. Spaniels are the oldest class of gundog in existence, going back at least to the late Renaissance. Flushing spaniels combine hunting, flushing, and retrieving skills. Flushing spaniels that are used in the modern field include the Brittany, the English Springer Spaniel, the slightly smaller Welsh Springer Spaniel, and the field bred American and English Cocker Spaniels. The larger two chiefly are used for retrieveing and flushing game in thick grass or mild underbrush, with the Brittany having working habits closest to later developed pointers. Cocker Spaniels are generally used for thick prickly brush that they can duck, dive and dodge in pursuit of smaller game like rabbits, and Clumbers, Sussex, and Field Spaniels are preferred for their slower, methodical hunting pattern. The American Water Spaniel, Irish Water Spaniel, Kooikerhondje, and the Boykin Spaniel are noted for their water work and do very well in temperate water, with the last being adapted to subtropical swamps. They fall into the water spaniel category. Many of these breeds vary their game according to the desires of the hunter: American Water Spaniels are known to be able to go after animals as big as a large goose in the water or the much smaller prairie chicken out of the water. Boykin Spaniels have a coat more closely adapted to the warmer temperatures of the American South whereas Irish Water Spaniels are adapted for cool, damp conditions, hence the curly coat and whiplike tail of the latter. Like spaniels, hounds generally fall into two types: Sighthounds and scenthounds. The scenthounds are the younger of the two classes. Typical examples of the scenthound family include the Beagle, Bloodhound, members of the Coonhound family, and the Grand Bleu de Gascogne. There is great variety in how this group operates, but the one constant is having some of the strongest noses in dogdom: Bloodhounds have been used for hundreds of years to track both man and beast, sometimes on trails that have been sitting on the ground for days. Coonhounds were originally bred in the American South. They are still used to this day to hunt many different kinds of beasts, ranging in size from the squirrel to the American black bear, so accordingly they are bred for great stamina in multiple terrain, on water and land (all are excellent swimmers,) a loud booming bark that can carry for miles, and a short coat that pairs well with a humid subtropical climate. Beagles have been bred since at least the 16th century as rabbit and fox hunters who will relentlessly pursue the scent of prey even when it goes to ground and were originally intended to work in large packs:they have a gregarious temperament. A Grand Bleu de Gascogne is a very large breed of scenthound that is also quite old: it was a common dog for noblemen to use in their hunting parties and also was a pack hunter; many scenthounds in France were kept by wealthy men to trail quarry on private estates. Sighthounds are different from scenthounds in their methods and adaptations. The long lean head of the sighthound gives it a greater degree of binocular vision, and the body is usually quite slender with an elongated lower spine, giving a double suspension gallop when it runs. In many cases this class is older than the scenthound group: the greyhound, the Scottish Deerhound, and the Saluki have origins going well back into the Middle Ages and earlier. Their speed, agility and visual acuity are particularly adapted for coursing game in open meadows or steppes, and all of them are adapted for running down prey rather than just sniffing for them until they catch up. They are independent in nature, and are worked singly or in a "brace" of two or three dogs. Sighthounds are generally quiet and placid dogs compared to other hunting breeds, but are capable of explosive speed. Rhodesian Ridgebacks are one of the few hound breeds with both capabilities, and though they are not the fastest runners they are notable for having exceptionable endurance. Setters and pointers hunt over long distances to find game birds like members of the pheasant and quail family, using their noses to find the prey and then sneaking up on them in the brush, showing the hunter exactly where the bird is hiding. Most of this family comes from Europe, and would include the Shorthaired, Wirehaired, Shorthaired German Pointers and Weimaraner from Germany, The Viszla from Hungary, Bracco Italiano from Italy, and field bred Irish Setters, Irish Red and White Setters, English Pointers, English Setters, and Gordon Setters from the British Isles. Many in this group share traits with spaniels in terms of the coat they have: it is easier to pick out bits of nettle from a long coat than a short one and the coat itself offers some protection from damp and thorny conditions. Water dogs fall into two categories: the retrievers and multi-purpose. Retrievers are excellent swimmers with characteristic webbed feet, and many derive from either Canadian, American, or British stock. Retrievers typically have oily coats that help repel icy water, and are noted for having high intelligence and being very strongly bonded to their masters. The Nova Scotia Duck Tolling Retriever is very unusual in the fact that it "tolls"-plays around in the hopes of attracting the attention of waterfowl from above and then letting its master shoot the bird, whence it retrieves it and goes back in the blind. Golden Retrievers are originally from Scotland: their long, flowing double coats make them ideally suited to Scotland's rainy wet climate and their patience on land and in water is the stuff of legend; they shall wait for a bird for hours and will obey their master so long as master rewards him with fond affection. Chesapeake Bay Retrievers, very popular in the United States, are bred to jump in water after ducks and geese even when there is a coating of ice over the water-they have deep chests meant to act as a jackknife that will cut through it when they swim. Most famous of all is the Labrador, native to an island in Maritime Canada but popular around the world: the field type Labrador has longer legs and a slimmer frame than the show type that is better known in Britain, but both show signs of being attracted to water from puppyhood. Other water dogs are multi purpose. Standard Poodles fall into the water dog category because they originally were used by wealthy Germans to hunt ducks; they predate most types of water dogs. Today there are kennels in the United States that have revived the breed for this purpose, with some dogs proving adept hunters at flushing bobwhite quail and common pheasant and achieving very high ranks in competitions, sometimes beating the more popular Labrador Retriever. They are highly intelligent, second only to Border Collies in rank in overall aptitude, and hunters must be very specific in indicating what they want when giving commands: they cannot be trained by conventional means and require very concrete signals to indicate what is desired so they may solve the puzzle themselves. They are excellent swimmers whose coat requires a simple bath after a swim and a simple cut about an inch off the skin rather than the impractical show clips. Portuguese Water Dogs are medium-sized dogs that will retrieve just about anything from the water and have a strong instinct to swim, plus they will guard whatever quarry a hunter keeps: they are one of the only water dogs that were bred to hunt fish. Terriers were bred to kill, and are one of the few hunting dogs that have worked in urban environments: many terriers of English, Scottish, and Irish extraction were extremely popular for killing vermin. Unlike many other hunters, this group did not exclusively work in rural areas: rats were rampant in Victorian era London, Edinburgh, Cardiff, Dublin, Birmingham, Belfast, and Glasgow, and poisons had marginal effects: the rats bred in the dirty conditions of these cities faster than traps could be laid. It became very profitable for working class men to have a profession where they trained small dogs to sniff out and kill as many rats as they could as fast as they could. In fox hunting, they are often paired with hounds should prey go to ground, since most breeds of terrier will pull the fox out of its hole and never back down until its master calls it off. Members of the bull and terrier subfamily are used in the United States and Australia for the hunting of feral pigs, often paired with scenthounds-their job is to wait until the hounds have found the pig and thereafter to charge at it in an explosion of strength and stamina, throwing themselves at the pig and keeping it busy until the hunter comes to kill it. They are bred to have great courage and lightning fast reflexes, protecting their master and the other dogs from the sharp tusks of an adult boar and the bulldog blood of their ancestors whispers to them to bite down and never let go. Hunting the hart (16th Century) from Turbervile, copied from Jaques du Fouilloux. Deeley, Martin. "Working Gundogs: An Introduction to Training and Handling. (1990,reprinted 2002) The Crowood Press. ISBN 1-85223-764-3. This page was last edited 23:11, 8 June 2017 by Wikipedia user Pineappleupsidedown. Based on work by Wikipedia user Jdforrester (WMF) and Wikipedia anonymous users 77.56.53.183 and imported>Donner60.